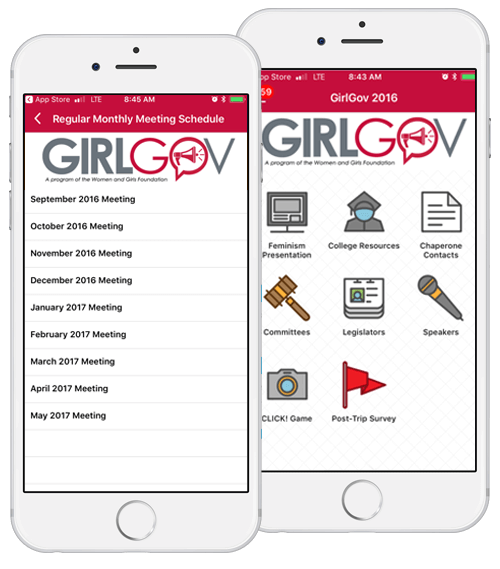 Learn how the Women and Girls Foundation (WGF) multi-event app kept high school students engaged throughout the year and, in the process, helped their team secure an additional $5,000 in grant funding. "We only have 4 people on staff and we are able to make a really professional looking app ourselves." WGF’s GirlGov, a year-round program for girls entering 9th to 12th grade, provides the opportunity to learn, first hand, about civics, government, philanthropy, youth organizing, community involvement, women’s history, and leadership. WGF needed a way not only to coordinate its yearly trip to Harrisburg, the capital of Pennsylvania, but also to provide a method that would allow the students across 42 school districts to stay in touch with one another throughout the year and to provide them with resources and information. Because participants were all young women, the solution not only had to meet all their event goals but also protect the student’s privacy. How do you keep high-schoolers’ attention? You reach them where they spend the majority of their time, on their mobile devices! Creating a mobile event app where the program’s activities, resources, and conversations could all be found in one place made the app a fun and valuable tool for the students. Students have a lot going on in their lives. They have to juggle academics, hobbies, sports activities, and social circles. Getting a share of their attention can be difficult, and emails often get ignored. WGF uses CrowdCompass’s Push Notification feature to communicate with program participants. It is a great way to stay on the student’s radar and remind them of upcoming monthly events. Now students and their parents and guardians know exactly wherethey need to be and when they need to be there. WGF has a wealth of resources available to program participants and their parents. Using the app, staff can deliver scholarship application information at the beginning of the year, and send financial application information closer to the end of the year. The ability to quickly upload timely documents right into the app puts the right information literally at the students’ fingertips when they need it most. WGF wanted to provide a safe and engaging way for the students to strengthen the bonds they made and continue collaboration after their trip to the state capital. Students not only messaged each other within the app, posted photos to the Activity Feed and shared their stories throughout year, but also eagerly downloaded the app and dug right into it when they returned the following year. While the students love the games, Simmons and her small staff value the flexibility of the app. Staff can easily change the content once the June retreat is over to provide information on each upcoming monthly meeting, which also helps keep the students’ attention as they can see fresh content whenever they log in. Being able to consolidate rosters, room assignments, agendas and handouts all within the app saves WGF the time and labor of producing printing materials. 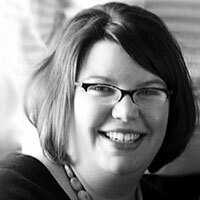 Simmons estimates that her team saved hundreds of hours leveraging the app. That consolidation is also a money saver as they do not have to produce hard copies of all that material anymore allowing Simmons to reinvest those savings into elevating other areas of the program. Plus, should a new volunteer or staff member come on board, CrowdCompass provides a variety of resources, taking much of the burden of training off the event planners at WGF. The ability to restrict access to the mobile event app to ensure only students in the program would be able to see event content and communicate with other students was a requirement that CrowdCompass fully met. WGF is able to allow Parents to download the app to see what content is being provided to the students, and receive push notifications being sent by WGF, but to preserve student privacy WGF restricts Parents from seeing the participant list and access to the student’s data within the app. Because WGF is 100 percent funded by grants, it is imperative they are able to quantifiably show the success of their programs. By pulling pre and post program survey data right from the app, WGF can show funders just how much the students have learned over time. The survey, conducted before and after the retreat asks students questions like, who are their state senators, and what bills are up for consideration. Being able to show funders the app, program agenda, engagement activities and survey results helped Simmons secure an additional $5,000 in grant funding. CrowdCompass is proud to provide a tool that helps the Women and Girls Foundation mentor outstanding young women who will one day help write new legislation, run for office, or play in important role in their communities. The Women and Girls Foundation is a small non-profit organization based in Pittsburgh, PA with a mission to achieve equality for women and girls, now and for generations to come. "We are able to lock down our app so that just anyone who goes to the app store can’t see and download it." Considering turning your youth programs, meetings, and events into a digital experience by providing key content and networking tools within a mobile event app. Deeply connect students to your organizations mission and achieve greater event engagement with CrowdCompass’s robust offering.